Is an organic reaction very similar to the Wittig reaction, but with some substantial difference. The reaction allows indeed to synthesize olefines (alkenes) through a particular carbanion, a phosphonate carbanion. The first part is actually a "different" reaction called Arbuzov reaction. Phosphorus of alkyl phosphite shows a lone pair (remember that P belongs to the fifth group of the periodic table). This lone pair is particularly available, reactive (phosphorus is a very good soft nucleophile), and attacks the electrophilic carbon bound to the halogen. The reaction is a nucleophilic substitution SN2 and contestually bromide (Br-) leaves. The resulting intermediate is positively charged, in particular shows a positive charge on phosphorus, that is surrounded now by 4 electrons (neutral phosphorus has 5 electrons in the outer shell, just like nitrogen). This makes carbons linked to oxygens strongly activated electrophilic centers. 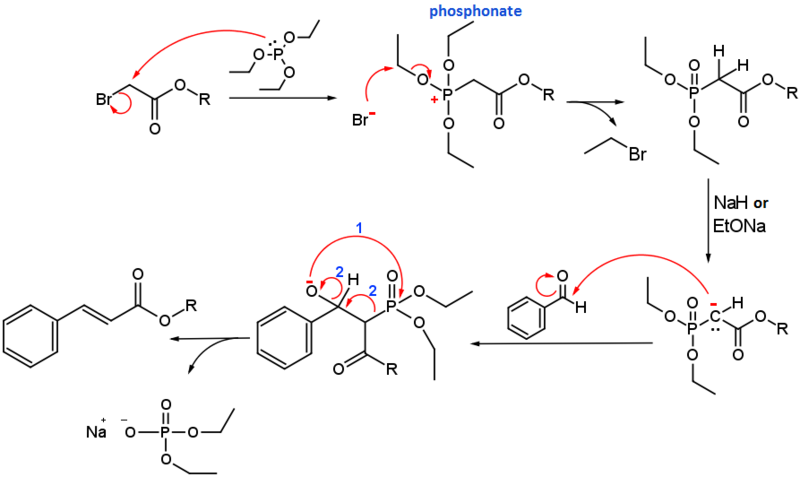 Therefore, even such a bad nucleophile as Br- succeeds to react in an SN2 reaction with one of these carbons. Contestually oxygen (much more electronegative than C) takes on himself bonding electrons. This second step of Arbuzov reaction is a dealkylation. We've obtained a phosphonate ester, the starting material to carry out Horner Wadsworth Emmons reaction. The advantage of using a phosphonate ester is that it can be easily deprotonated to generate a stabilized carbanion. This may remind you the same step in Wittig reaction, when ylides carbanion are produced trearing obligatory with a strong base. Well, is easier to do the same on phosphonates, because also a weaker base would work well, like a hydride. Once generated the stabilized phosphonate carbanion this can react with an aldehyde (or ketone). The lone pair adds to the carbonyl and the intermediate we get to has a negative chargenon oxygen. Again in Wittig reaction we've already seen how P-O bond is thermodynamically/energetically favoured. The intermediate develops spontaneously through a concerted mechanism to five the resulting alkene (C-P bond breaks down, polarized toward carbon, with the contextual formation of a much more stable P-O bond). The phosphonate carbanion (Horner reaction) differently from phosphorus ylides, is stable only since it shows esters functional group. Not all the alkyl halides would therefore work to carry out Arbuzov reaction. 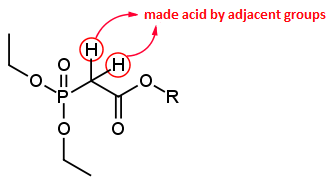 Horner reaction can be carried out using weaker bases than are necessary to carry out Wittig reactions. This is because the carbonyl group and phosphorus with three oxygen attached contribute to male more acidic phosponate protons. While Wittig reaction is utilized above all to synthesize Z- alkenes (even if can give also E-alkenes), Horner Wadsworth Emmons reaction in only E-selective. Somehow this means that this two reactions are complementary, they belong to the same family. They both allow to transform a C=O bond in a C=C bond but with opposite stereoselectivity.